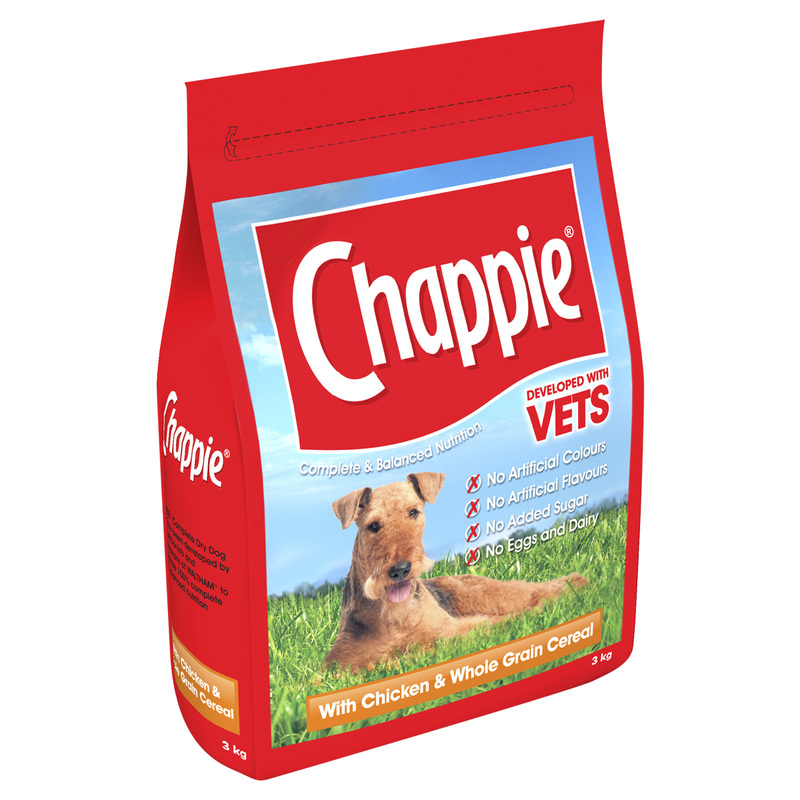 Chappie Dry Food is a nutritionally balanced diet for dogs of adult age and all breeds. The food combines a hearty balance of blended ingredients, including rich proteins, fortified vitamins and controlled fats. The fresh meat content offers a rich and vital source of protein to support your dog's growth and development, enhance its physical condition and strengthen its natural defences. The highly digestible and palatable recipe will suit even the fussiest appetites, helping to nourish and protect from the inside out. Cereals (including 4% Whole Wheat), Meat and Animal Derivatives (including 4% Beef), Oils and Fats, Minerals, Antioxidants. Cereals (including 4% Whole Wheat), Meat and Animal Derivatives (including 4% Chicken), Oils and Fats, Minerals, Derivatives of Vegetable Origin, Antioxidants. Protein: 20%, Fat content: 6.5%, Inorganic matter: 7.5%, Crude fibres: 3%, Omega 6 fatty acids: 1.44, Omega 3 fatty acids: 0.16. Additives per kg - Nutritional additives - Vitamin A: 19895 IU, Vitamin D3: 1746 IU, Vitamin E: 352 mg, Vitamin B1: 9.2 mg, Vitamin B2: 18.9 mg, Niacin: 35.4 mg, Vitamin B5: 41.3 mg, Vitamin B6: 4.7 mg, Biotin: 0.38 mg, Vitamin B9: 2.8 mg, Vitamin B12: 0.06 mg, Cupric sulphate pentahydrate: 66.9 mg, Calcium iodate anhydrous: 1.7 mg, Manganous sulphate monohydrate: 377 mg, Sodium selenite: 0.58 mg, Zinc sulphate monohydrate: 549 mg. Protein: 20%, Fat content: 6.5%, Inorganic matter: 7.5%, Crude fibres: 3%, Omega 6 fatty acids: 1.6%, Omega 3 fatty acids: 0.18%. Additives per kg: Nutritional additives: Vitamin A: 20907 IU, Vitamin D3: 1835 IU, Vitamin E: 370 mg, Vitamin B1: 9.7 mg, Vitamin B2: 19.8 mg, Niacin: 37.2 mg, Vitamin B5: 43.4 mg, Vitamin B6: 5 mg, Biotin: 0.4 mg, Vitamin B9: 2.9 mg, Vitamin B12: 0.06 mg, Cupric sulphate pentahydrate: 63.5 mg, Calcium iodate anhydrous: 1.6 mg, Manganous sulphate monohydrate: 358 mg, Sodium selenite: 0.55 mg, Zinc sulphate monohydrate: 522 mg.
You might have to adjust the amount of food according to the level of activity, breed and age of your dog. Allow for a transition phase when switching diet. Fresh water should always be available. Please ensure that your dog is healthy and has a healthy body condition when using the feeding guide. Store in a cool, closed and dry place. 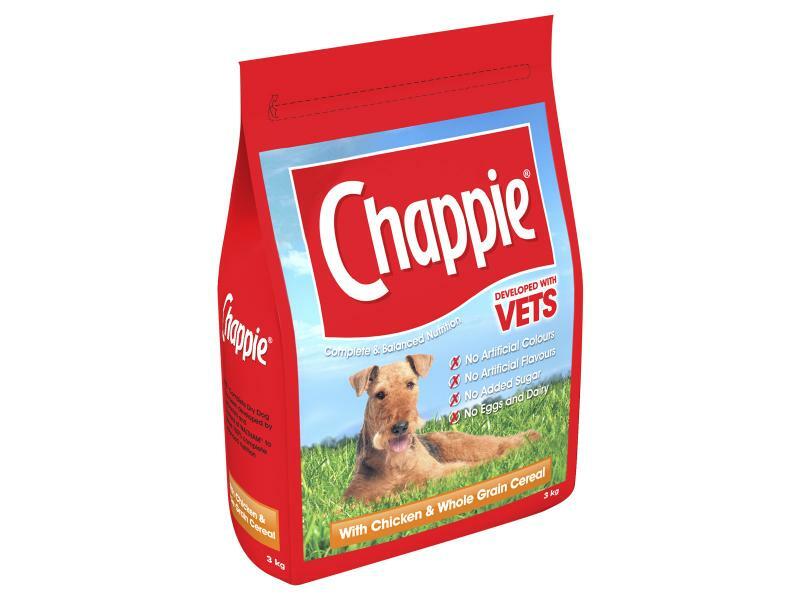 Below are some recent questions we've received regarding Chappie Adult Dry Dog Food, including answers from our team. MY DOG IS DIABETIC. IS THERE SUGAR OF ANY KIND IN THIS FOOD. There is no sugar added to this food. However it is mostly cereal and I feel that a meat-based diet might make diabetic control easier. That is however more expensive so might not be an option. You could look at the Nature's Menu Dog food range.